Farmers-Caesareans all-rounder Charles Perchard has been named as Jersey's cricketer of the year after helping his side to the island's Premier League title. He won the award ahead of fellow nominees Ben Kynman, Ben Beeley and Corey Bisson. "A lot of players performed really well so it must have been hard to decide," Perchard told BBC Radio Jersey. "I've been a consistent performer so I'm happy to get a bit of reward." The 22-year-old, known as "Chuggy", won the accolade after a season in which he scored 258 league runs and took 14 wickets for his club in the 50-over format, putting him in the top five in each discipline. He also impressed for the island side, featuring in ICC World League Four and Five tournaments in Malaysia and Singapore respectively. Bisson (Rathbones OV's) picked up the batsman of the year award at Friday's ceremony, while Kynman (Farmers-Caesareans) took the equivalent bowling title. Recently-capped Jersey spinner Rhys Palmer was named as the island's young player of the year. 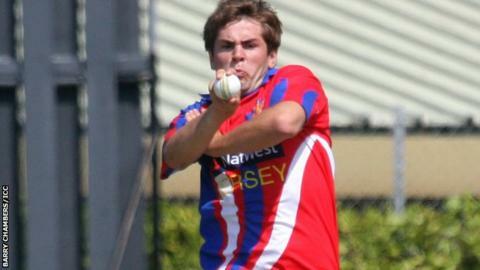 "Corey, Rhys and Ben are terrific players and the future is bright for Jersey cricket," added Perchard. "There are so many good young players coming through and I'm excited to be part of the team, if I am, in five years' time because we'll be much better than we are now hopefully."